Home Genre Children Books At The Barber: A Cutting-Edge Deal! Books At The Barber: A Cutting-Edge Deal! Sometimes, an idea comes along that re-affirms our faith in humanity. This heart warming idea takes us all the way to Ypsilanti, Michigan and it’s about a Barber Shop. Prepare yourself for warm fuzzies. Most parents know the struggle that is a ‘haircut’ for their kids, and this smart, forward-thinking barber shop has found a way to keep kids sitting still AND save parents a few bucks. Parents everywhere, rejoice! So how did they manage such a fine feat? The Fuller Cut Barbershop (owned and operated by Alex Fuller) uses books to keep kids occupied, engaged, and to give a great deal to parents. A two dollar discount is given to every child who reads out loud to the barber while getting their hair did! So fun! The benefits to this practice go far beyond the obvious. All of the rotating book selection found in the shop feature African Americans in a positive light. The Fuller Cut thrives to include material that isn’t as taught about in schools. This includes works on Nelson Mandela, Ray Charles, Louis Armstrong, and other influential black historical figures. Finding children’s books that feature characters that are not white is a challenge enough, let alone to have a collection of over 75 titles. Recently, we posted an article showcasing several books that are ideal for introducing diversity to children. The article (as well as countless others) outline the importance of a multicultural bookshelf for our children. Alex Fuller and his staff are striving to provide their young readers with an experience they won’t find elsewhere. Although the idea isn’t completely original, it’s absolutely smart. The shop owes this inclusion to a long-time barber named Ryan Griffin. Mad props to you, Griffin! The read out loud factor of the program is great for confidence building, as well as language development and public speaking skills. It’s truly a key to success for many young clients. 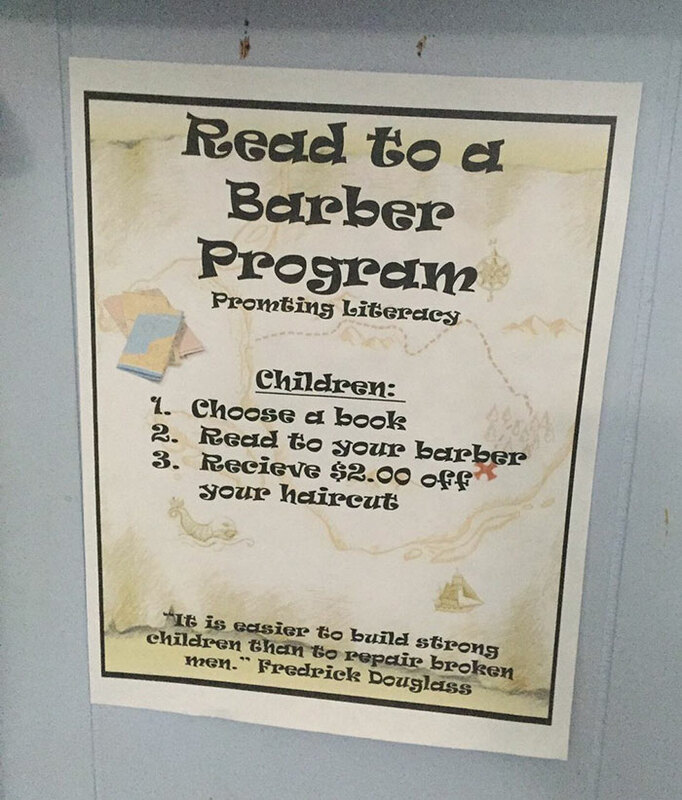 Nowadays, people are choosing to bring their business to this totally ingenious barber shop because they know and love this reading deal. Even more awesome, children see other children reading, and thus reading becomes cool to that child. It doesn’t get any better. Inspiring youth. Check. Positive role models. Check. All the right feels. Double check! Does this barber shop give you hope for humanity, too?